Surrounded by the waters of the Aegean Sea and exquisite lush greenery, La Marquise Luxury Resort provides a truly exotic and luxurious stay. The resort is one of the largest hotel complexes in Rhodes, spanning over 120,000 square metres. Guest rooms are spacious and contemporary, furnished with dark wood and luxury fabrics. Choose to stay in a villa, complete with a private pool, Jacuzzi and a jet shower cabin for the ultimate travel experience. La Marquise is perfect for families and couples alike, with a large range of bars and restaurants, exciting clubs for kids and teens and an adults-only section. Those wanting to unwind can head to the Wellness Spa, which offers a wide range of massage treatments, a steam room and even a beauty salon. The Aegean Sea is right on your doorstep and can be accessed by a private, underground passage leading from the hotel. Rhodes town is also only a few minutes away, giving guests the opportunity to explore the ancient ruins and cobbled streets of the Old Town. Buffet breakfast, lunch and dinner. Continental breakfast is available until 11:00 (reservations required). A children's menu is available from 12:30–14:30 and 18:30–21:15. Four themed buffets per week (Greek, Italian, Asian, and Mediterranean). Three dinners in the à la carte restaurant per 7 night stay or unlimited if staying in a Junior Suite Pool View, Bungalow Private Pool, Luxury Suite Pool View, Panoramic Suite Private Pool or Villas with Private Pool (reservations required). Ice cream from 11:00–18:00. Coffee, tea, snacks and cakes from 16:00–18:00. Non-alcoholic and local alcoholic drinks from 10:30–00:00. Activity and entertainment programme 3–5 days per week. Kid's club (6 days per week). Teenager's club. Tennis. Basketball. Aerobics. 12-hole mini golf. Beach volleyball. Water polo. Table tennis. Fitness Centre. Wellness centre with indoor pool, whirlpool, sauna, steam bath and yoga. Hotel child prices apply to ages 2-12 years. The hotel has 386 rooms. Surrounded by Da Vinci inspired paintings, waterfalls and LED lit tiles, this restaurant provides a stunning dining experience and serves Greek, Mediterranean and international cuisine. Guests on half board can eat a buffet lunch or a buffet dinner at this restaurant. 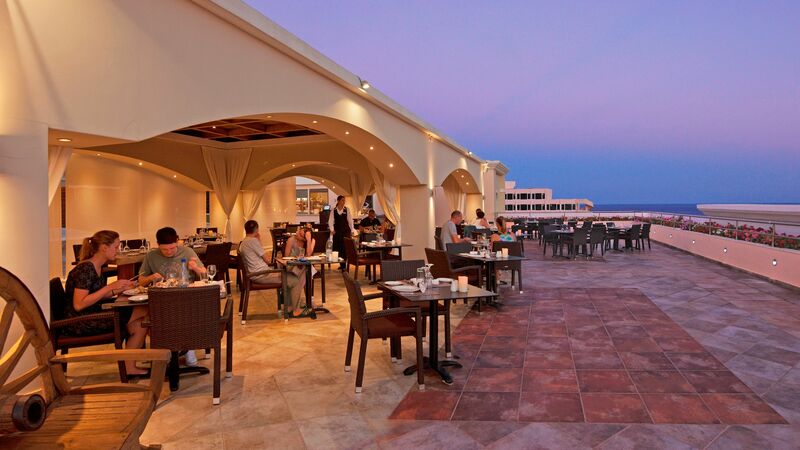 Located on the top floor, L’Etoile offers panoramic views over the sea and hotel grounds. It’s elegant and romantic, with first class service and delicious Mediterranean cuisine. Guests on Half Board (excluding guests staying at the Superior Rooms and Family Suites) can dine a la carte at this restaurant. Experience some of the best flavours of Asia accompanied with fine wine while overlooking the ocean. This poolside bar and restaurant will keep you refreshed throughout the day with its excellent collection of cocktails, cold drinks and light bites. Located in the adults only section of the resort, guests can enjoy glass of wine or cold drink in a sophisticated, peaceful setting. 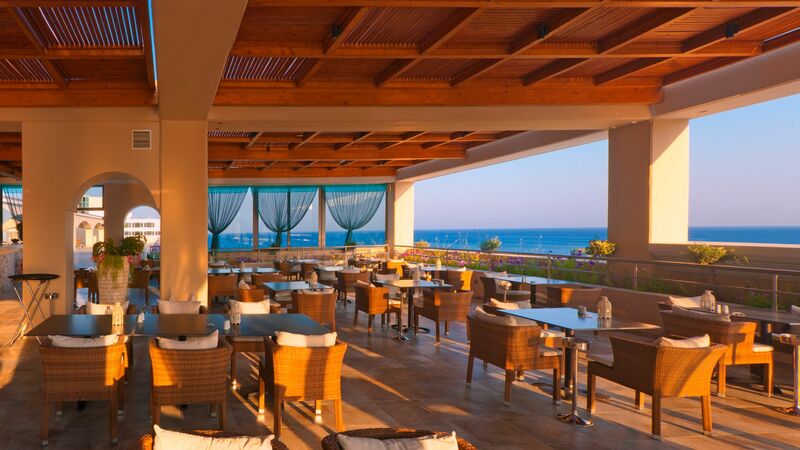 Come to Luna Panoramic Bar to enjoy breath taking views over the ocean with an exotic cocktail in hand. 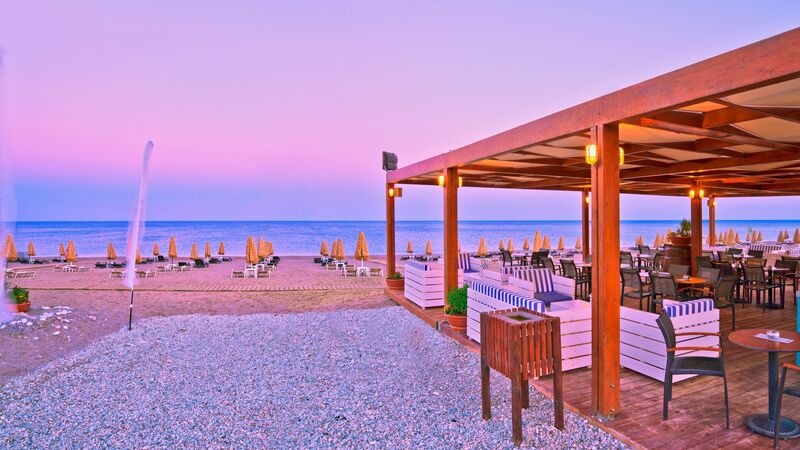 Located on the stunning Kalithea beach, this bar provides a friendly, relaxed atmosphere. 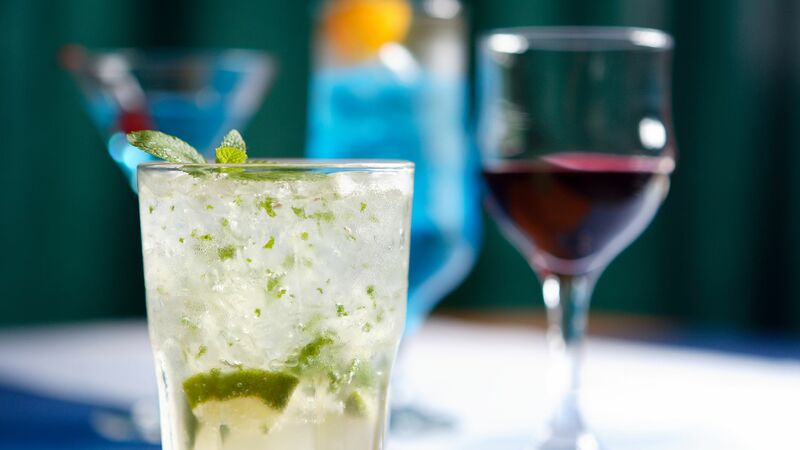 Enjoy a cold drink or a light bite from your sunbed or on a cosy, shaded sofa. 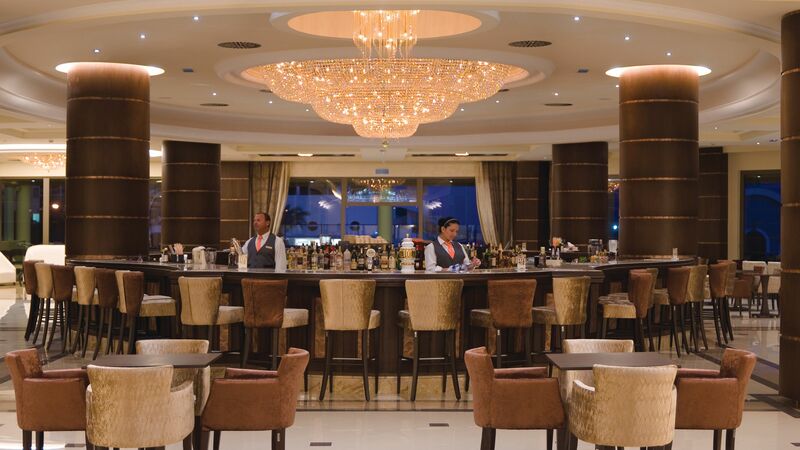 This relaxed lounge bar offers the perfect place to unwind with a coffee or snack throughout the day. Come back in the evening to enjoy live piano music with a cocktail. 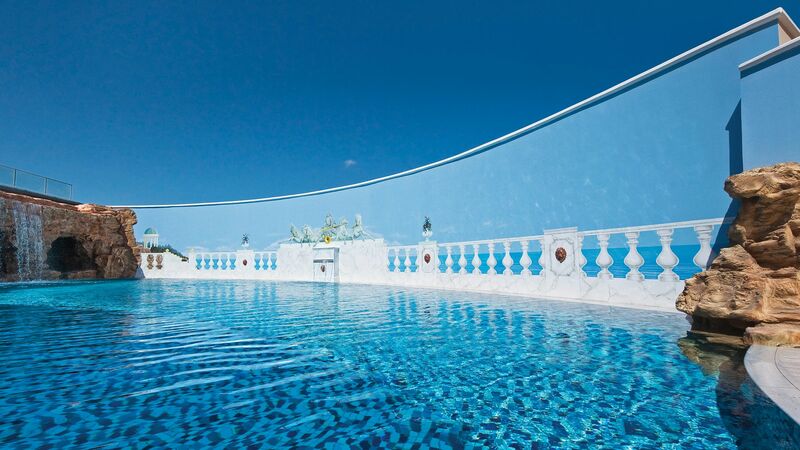 La Marquise boasts seven swimming pools, including two adult only pools and a children’s pool. All are filled with fresh water, and sunbeds and umbrellas are provided. Head to the Blue Flag awarded Kalithea Beach via the hotel’s underground passage, where the enticing waters of the Mediterranean are waiting. 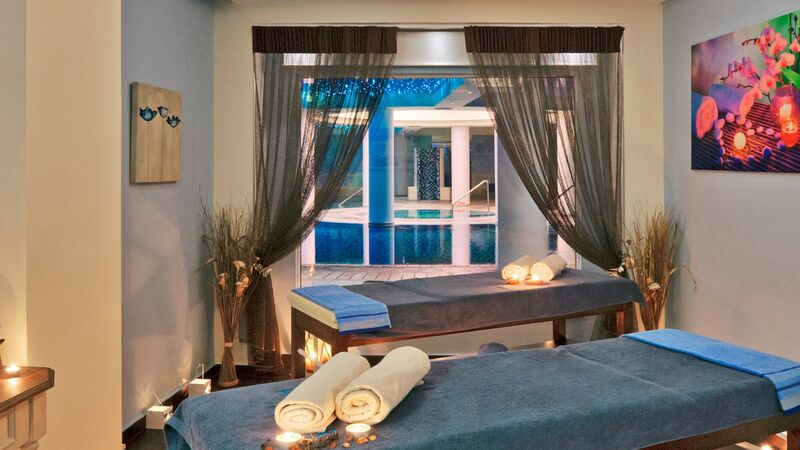 Renowned as one of the finest spa centres in Rhodes, La Marquise Spa promises a truly serene experience, complete with steam rooms, massage treatments and an invigorating sauna. 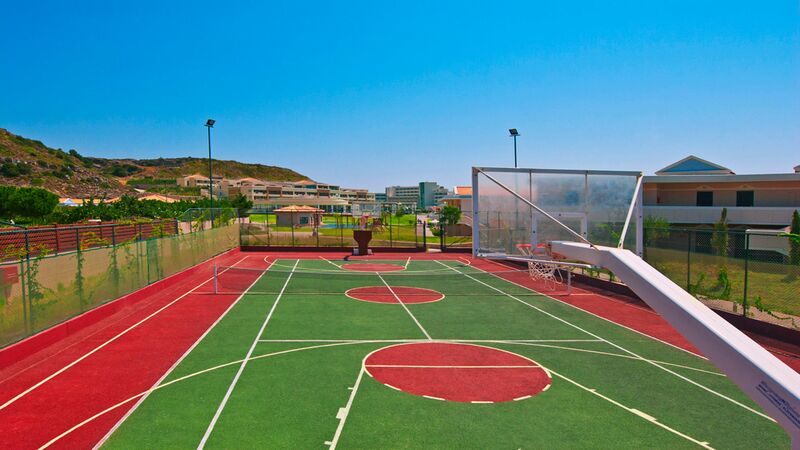 La Marquise has plenty on offer to keep everyone busy, with tennis courts, mini golf, basketball, volleyball and a range of water sports, including jet skiing and banana boat rides. 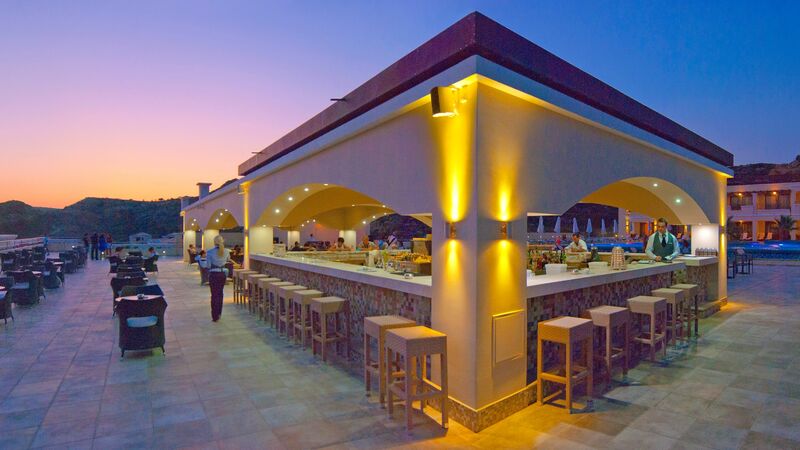 In the up and coming town of Kalithea, on the north east coast of Rhodes, you’ll find La Marquise Hotel. It’s ideally located for those wanting to spend long, lazy days on the beach, as well as being within easy reach of Kalithea. Here you’ll find some excellent bars and restaurants, as well as a pretty waterfront area surrounded by colourful houses. When it comes to day trips, book a boat trip and explore underwater with snorkelling or scuba diving, or visit lively Rhodes Town or nearby Faliraki. 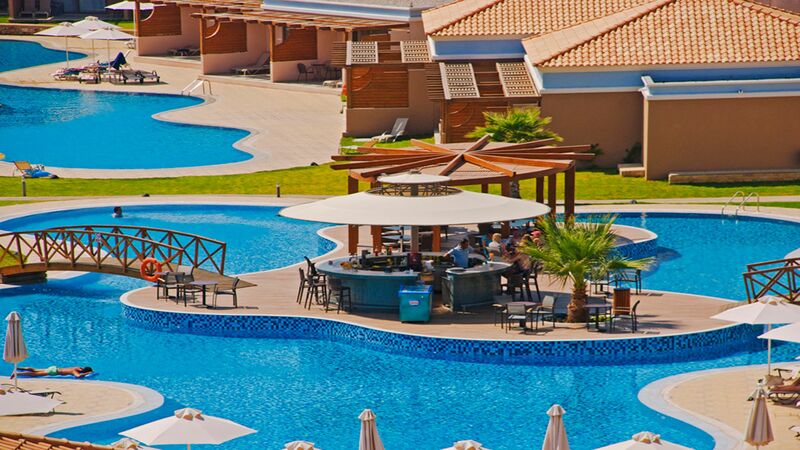 Families and those who are young at heart will love Kalithea Water Park, which is just a 5 minute drive away. La Marquise is a 25 minute drive from Rhodes Airport. Decorated in light brown tones, the Superior Guest Room Garden View rooms are located near the lagoon area, overlooking the beautiful gardens. The rooms feature double or twin beds, comfortable sitting area and a balcony or terrace. These rooms are located either beside the pool in the lagoon area or at the top of the main building, offering a view of the pools, sea or resort. Featuring either double or twin beds, the rooms have a comfortable sitting area and a balcony or terrace, ideal for enjoying an afternoon cup of tea. Located either in the hotel's pool complex or in the main building, the spacious Family Suites provide an ideal accommodation for families with children, featuring a master bedroom with double bed and a sitting area, living room with two sofa beds and a bathroom with a luxury bathtub. Luxury Suites are located in the swimming pool area and feature a master bedroom with king size bed, sitting area and en-suite bathroom, separated via sliding doors from the living room with a dining corner and an additional toilet and shower room. Outside, there is a veranda with views over the pool and hotel grounds. Guests staying in Luxury Suites can enjoy the enhanced benefits of a private check in area, welcome drink upon arrival, early check in and late check out (subject to availability), turndown service and farewell gift. A fully stocked minibar which is refilled once per week is also included. Guests in a Luxury Suite Pool View choosing half board or all inclusive will receive a 'Black Card' on arrival which entitles them to dine in any of the à la carte restaurants at no extra charge when staying a minimum of 7 nights (reservation one day in advance is required). The luxury Panoramic Suites are situated on the top floor of the main building, offering amazing views over the sea and the resort. The two-storey suites consist of a stylish sitting area with a dining corner and a small bathroom, whilst upstairs there is a master bedroom with a king size bed, a living area, further bathroom and a furnished balcony making the most of the lovely views. The suite offers a direct access to an individual pool and a gazebo, ideal for lazy afternoons. Guests staying in Panoramic Suites can enjoy the enhanced benefits of a private check in area, welcome drink upon arrival, early check in and late check out (subject to availability), turndown service and farewell gift. A fully stocked minibar which is refilled once per week is also included. Guests in a Panoramic Suite with Individual Pool and Sea View choosing half board or all inclusive will receive a 'Black Card' on arrival which entitles them to dine in any of the à la carte restaurants at no extra charge when staying a minimum of 7 nights (reservation one day in advance is required). Conveniently located in the main building, the Junior Suites offer a lovely view over the resort and the sea. The suites feature a bedroom with a comfortable sitting area and an en-suite bathroom. A separate shower room is also available for additional comfort. Please note the image is of a Junior Suite Pool View. Sea view rooms are similar, offering views of the sea instead. Guests in a Junior Suite Sea View choosing half board or all inclusive will receive a 'Black Card' on arrival which entitles them to dine in any of the à la carte restaurants at no extra charge when staying a minimum of 7 nights (reservation one day in advance is required). The Junior Suites Pool View are located in the adult-only area, on the upper level of the hotel, overlooking the swimming pools. Lavishly decorated, they feature a bedroom with a sitting area and en-suite bathroom with double sink and luxury bathtub. A separate shower room is also available for added privacy. Guests staying in Pool View Junior Suites can enjoy the enhanced benefits of a private check in area, welcome drink upon arrival, early check in and late check out (subject to availability), turndown service and farewell gift. Guests in a Junior Suite Pool View choosing half board or all inclusive will receive a 'Black Card' on arrival which entitles them to dine in any of the à la carte restaurants at no extra charge (reservation one day in advance is required). Located away from the busy areas in the adult-only section, the bungalows offer a romantic hideaway, featuring a bedroom with a king size bed, bathroom with double sink and luxury bathtub and a separate toilet and shower cabin. The stylish sitting area leads directly onto a terrace with individual pool and sun loungers. Guests staying in bungalows can enjoy the enhanced benefits of a private check in area, welcome drink upon arrival, early check in and late check out (subject to availability), turndown service and farewell gift. A fully stocked minibar which is refilled once per week is also included. Guests in a Bungalow with Individual Pool choosing half board or all inclusive will receive a 'Black Card' on arrival which entitles them to dine in any of the à la carte restaurants at no extra charge when staying a minimum of 7 nights (reservation one day in advance is required). Located in a secluded area at the top of the resort, the spacious two storey villas offer a private luxury accommodation, away from the main hustle and bustle of the resort. The top floor features a master bedroom with dressing area and a bathroom with Jacuzzi® bath and a separate shower cabin and downstairs, there is a second bedroom with additional bathroom and an airy sitting room with a dining corner. Outside, the private garden leads to a terrace with pool and a gazebo with sun loungers. Guests staying in the villas can enjoy the enhanced benefits of a private check in area, welcome drink upon arrival, early check in and late check out (subject to availability), turndown service and farewell gift. A fully stocked minibar which is refilled daily is also included. Guests in a Villa with Private Pool choosing half board or all inclusive will receive a 'Black Card' on arrival which entitles them to dine in any of the à la carte restaurants at no extra charge when staying a minimum of 7 nights (reservation one day in advance is required). Decorated in light brown tones, the Superior rooms feature double or twin beds, comfortable sitting area and a balcony or terrace. Save up to 15% on the hotel price for holidays between 01 May - 31 October 2019 booked by 31 March 2019. Save up to an additional 5% for holidays between 01 - 31 May and 15 - 31 October 2019 booked by 31 March 2019. Wow, where can I start! Everything from start to finish was amazing, and we both said was the best holiday. It was perfect in every way, everything we wanted from a hotel was here. The grounds, staff, food and decor was to a very high standard. Even though it is a large complex, due to its layout, you didn?? ?t feel like a number. The staff stand out as they are so kind and genuine. The food was amazing, and we usually like to eat out a few nights. There was no need at this hotel. Every day I was there, I loved just soaking up the views and beauty of the resort. It has some very unusual plush decor touches. We had an upgrade to the adults only section and absolutely loved sunbathing so near to the room. We were amazed when we walked in the room, they were huge. These rooms are bigger than the other rooms though, I believe. We felt like we had been ur own suite. I cannot understand anyone saying anything negative about the hotel. We cannot wait to return. We spent 7 days in this hotel, service was very good, great food and drink choices. The days we stayed was quite rainy, but hotel's team was very helpful and we had a good time. Nice pool for kids and play area, animators was very friendly with our 2yrs boy. We had a room in the main building, the biggest minus was that our room was above kitchen/dinning room and I could hear trailers in the early morning hours being pushed. But I'm a light sleeper so it might be my problem. We loved pools in main area and on the top, beach was clean but rocky. This hotel was recommended & I am so thankful ,really deserving of five stars. The rooms are nice & roomy & are kept lovely & clean the hotel grounds are beautiful. The food excellent always fresh always refilled. The staff are very pleasant & friendly & work so hard & I mean all of them .it's a very busy hotel & still the standard is kept very high,I have seen the odd moan about the reception staff I found them lovely & very helpful I think maybe it's the way they are spoken to so if you want an excellent holiday this is the place to go.. we're going back again this year.